Even when Russian smoke generators fail they still get the job done.... how patriotic is that? Perhaps that vehicle was driven by Russian Hackers? Following the 144th, 150th and 42nd, the 3rd Motorized Infantry Division received its banners. It's time to calculate the strength of the military ground grouping of Russia, which has increased and decreased. All data are taken from open sources. All calculated figures from the evil one are my subjective judgments. Over the past year, the management of the 14th Army Corps, the 236th Artillery Brigade, the 171st Airborne Assault Battalion, two separate self-propelled artillery battalions of high power, five tank companies in the Marine Corps brigades have been reorganized. The formation of the 90th Tank, 3rd, 42nd, 144th and 150th Motorized Rifle Divisions, the 30th Motorized Rifle Brigade, and six separate tank companies as part of the Airborne Forces units were completed. In Wikipedia they write that, in the 106th Airborne Division, there is also a tank company, but I have not yet confirmed any evidence. In total, there are two hundred and forty-five motorized rifle, machine-gunning, artillery, flamethrower, engineer-assault, assault-landing, parachute-landing battalions and marine infantry battalions in the Land Forces, the troops of the RHBB, the engineer troops, the Airborne Forces and the Marine Corps, three separate engineering and assault companies, eighty-two tank battalions, sixteen separate tank companies, one hundred and thirty howitzer artillery battalions, seven gun artillery battalions, thirty-nine reactive artillery battalions (MLRS Grad / Tornado-G), forty-seven anti-tank artillery battalions, eight separate self-propelled artillery high power artillery battalions, eight separate self-propelled artillery battalions (NONA-propelled guns C / NONA-CRS / Host), one hundred ninety-one mortar battery. Now on the movement of the main types of weapons. New tanks in the troops for the year (as well as the last fifteen years) were not received. The volume of supplies of the upgraded T-72B / T-72B3 / T-80BV tanks is no more than 400 units. It is known that for the 2nd quarter of 2017, Uralvagonzavod sent 51 T-72B3 to the Ground Forces, and the 61st BTRZ - 49 upgraded T-72Bs.In total, about 3,200 tanks are in combat units, half of the tanks are likely to be conserved. The average age of our armored vehicles is "a little over thirty," but the pace of modernization of the tank fleet is quite satisfactory. For the second quarter, the troops received 35 new BMP-3. A total of about 100 new BMP-3s, 62 new BMD-4Ms, 20 new BTR-MDs, and about 100 new BTR-82A were received in a year. Also, the troops received repaired and modernized equipment - at least 400 BMP, BMD and BTR units. The 81st BTRZ alone reported the dispatch of 160 BTR-80 / 82AM to the troops for the year. I find it interesting on regards to tanks. Tanks are rather cheap for Russia and modern ones would give them a large edge while being a cheap spending for it. Now I'm curious why they are rather slow at upgrading existing tanks? They shouldn't cost much more/less than a million to upgrade, and they can pump out plenty (hundreds) in a year and still have long term work for the facilities. Are they just unsure what they want to do exactly? miketheterrible wrote: I find it interesting on regards to tanks. Tanks are rather cheap for Russia and modern ones would give them a large edge while being a cheap spending for it. Now I'm curious why they are rather slow at upgrading existing tanks? They shouldn't cost much more/less than a million to upgrade, and they can pump out plenty (hundreds) in a year and still have long term work for the facilities. Was watching some military show few days ago on RTR-Planeta which partially covered what you are wondering. It was about last 3 decades and few attempts by different men to reshape armed forces of Russia, which went to complete confusion as every new goverment and every new chief of staff/def minister pushed his own idea, so you had 3 or 4 different overhauls of military and none completed. And as one general said: "We decide something, agree on it, President signs it and then we "notice" there are no funds or cappacities for it, and it never goes pass papers". Now when you look though last 30 years, regarding the tanks only, idea first was to throw away T-80s as they are expencive to operate and to stick with T-90s and produce more. It all ended with fiasco as there was very little money to produce them, existing ones went mostly in disrepair and T-72s stayed as mainstray with minor updates, T-80s mostly got pushed from service. Then you had idea to do major modernisations of T-72s. Which they started with ambitious Rogatka modernisation, which...oh well... was too expencive and stalled. Then there was idea to produce more T-90s and modernise T-72s in less ambitious way. T-90 production ceased completely, T-72B3 updates came around. Now they are probably still not sure how soon Armata can enter serial production, what will be the final cost per hull, how many they will be able to afford, at which pace and if modernisation of existing tanks is waste or not. Then you probably have guys that are aganist modernisation, guys that are in favor of saving funds for Armata.. or some other projects that they consider more important. Its never one guy that decides.. more like... 100 and everyone has own opinion. That makes a lot of sense, from the late 90's to late 2000's, no one had a specific goal or idea what to do with it. Nothing compared to the Airforce in terms of planning and engagement - something the people dealing with procurement in ground forces should have figured out. If they just stuck to an idea/platform, even during tougher years where money wasn't available (but produced in lower numbers), then T-90's would have been dirt cheap by now, with plenty in service, and having an upgrade (T-90M) that could be fielded in a rather short period of time which then all T-80's that were eventually disbanded could have been replaced slowly by Armata's while T-90M would end up being mainstay of the army's tank forces. This would have been cheaper and ultimately, best idea in terms of having a modern capable tank forces and having the numbers behind them. But too many decisions. Cutting decisions. Creating new decisions. Cutting those decisions. Then going back to old decisions makes very little sense. Now because of the lack of forces, they have to up the number of tanks to keep in reserve (for getting rid of 10,000 tanks, its only going to be what, 5,000 - 6,000 tanks being recycled and rest will be in reserves). That will make logistics rather expensive and just upkeeping them to make even majority of those operational isn't going to be fun either. While the airforce, were aircrafts cost 30x more than a tank, are coming out in decent numbers and good, solid procurement plans. Heck, even ground forces in terms of missile forces, artillery and light forces have a better plan. I think now we will wait and see what Armata brings us. But I have a feeling that the Russian government may just borrow technologies learned from Armata and apply them to current tanks/upgrade to current tanks and have Armata's in very low production rate till they get the numbers they want. Minister of Defense reported in his annual report that there were 7 new units being formed in 2018. EDIT: although formed at the end of 2017, the new Artillery brigade at Kolomna for the 20th Army may also be considered one of the 7 new units. Oldies but goldies. I wonder if there will be any guided ammo riding on laser beams here? The special units of the Russian army will be armed with the legendary SPG-9 grenade launchers "Kopje". In Syria, they demonstrated high efficiency against field fortifications and enemy manpower. Thanks to the long range and high accuracy of the shooting, these recoilless guns proved to be a suitable means for dueling with enemy grenade launchers. In this case, one shot for LNG-9 is much cheaper than an anti-tank guided missile. The grenade launcher will undergo modernization - will receive a modern night sight and more powerful ammunition. Army special forces will saddle combat "Bears"
As "Izvestia" was told in the Defense Ministry, the anti-tank grenade launchers of the SPG-9 plan to return to the arsenal of special units. They will undergo modernization and will be used to combat manpower and suppress enemy firing points. During the Syrian campaign, militants actively used grenade launchers of Western production - Carl Gustav and PanzerFaust. For their suppression of the range of shooting conventional RPG-7 was not enough. But the enemy was coping well with the LNG-9, which were in service with the Syrian army. Initially, these products, adopted in service in 1963, were intended to combat armored vehicles. The cumulative grenade PG-9V has decent indicators of armor penetration - 300 mm. Later, for SPG-9, a fragmentation grenade was developed. The firing range of the "Spear" when it is used is about a kilometer. The LNG-9 is distinguished by a fairly high rate of fire - up to six rounds per minute. This is due to the fact that it is easy to recharge, and the gunner does not need to wait until the grenade hits the target. Shooting from the "Spear" does not require long preparation, the treatment of these weapons can be trained all the fighters. If necessary, the grenade launcher is disassembled and transferred by calculation forces. If, at the same time, to distribute at least two shots to all the soldiers, then one unit will have a very solid ammunition. Since the late 1980s, the "Spears" have gradually begun to give way to anti-tank guided missiles (ATGM) - the power of standard shots was not enough to break through the armor of modern tanks. However, ATGMs are quite expensive, so recoilless guns have remained very popular in developing countries. Military expert Oleg Zheltonozhko told Izvestia that such weapons are in high demand in conditions of local conflicts, when military operations are conducted by small highly mobile detachments. Special forces have to deal with a well-armed and prepared enemy, so they need additional firepower. "The militants receive the latest foreign weapons, they learned to dig in and equip positions, so the special forces need means of reinforcement, the same trench artillery," Oleg Zheltonozhko explained. - Due to the more powerful ammunition, the SPG-9 easily affects from a greater distance even the concrete reinforcements. In disassembled form, it can be transported by jeep or an armored car "Tiger", carried by a group of soldiers. The Pentagon is also actively returning to the old grenade launchers - the Swedish Carl Gustav. In the 1980s, they were purchased for ranger battalions, later replaced with anti-tank missiles. However, in Afghanistan, the US military carried heavy losses from the exact fire of the RPG-7 grenade launchers, which the detachments of the banned Taliban movement in Russia were actively using. ATGMs could not effectively deal with such a threat. The Pentagon decided to give out to the special forces, infantry and airborne troops, operating in Afghanistan, grenade launchers. Carl Gustav have proved their effectiveness. Therefore, now the US military uses them everywhere in Afghanistan and Iraq. According to the Izvestia newspaper, in the article by Nikolai Surkov, Alexei Ramm and Evgeny Andreev, "the Northern Caucasus was fortified with divisions, the Southern Military District is reinforced with new formations and modern equipment," the Ministry of Defense began an unprecedented reorganization of the main strike force in the south of Russia, the 58th Army. It will be significantly strengthened by the formation of two new motorized rifle divisions equipped with BMP-3 and the newest T-72B3 tanks. To accommodate these connections, existing and new military towns in Mozdok and Vladikavkaz will be reopened. Part of the 58th Army will be redeployed to the Stavropol and Krasnodar Territories. Experts note that in this way Russia is forming a general-purpose force that will contain the threat from NATO. As Izvestia was told at the Defense Ministry, at the end of 2018, the formation of two new motorized rifle divisions will begin as part of the 58th All-Arms Army. They will be created on the basis of the currently existing 19th and 136th separate motorized rifle brigades (OMSBR) by adding additional battalions and regiments. They are supposed to be armed with infantry fighting vehicles BMP-3 and T-72B3 tanks. The 19th Krasnoznamennaya Voronezh-Shumlenskaya Order of the Red Banner of Labor and Suvorov II degree, a separate motorized rifle brigade will again become a full-blooded division (in 2008 it was reduced to the current status). In this regard, the number of garrisons will increase. Under Vladikavkaz, several military camps will be repaired and returned to the deployment of the divisional units. A large garrison will also appear in Mozdok. The 136th Motorized Rifle Uman-Berlin Red Banner Order of Suvorov, Kutuzov and Bogdan Khmelnitsky, a brigade stationed in Dagestan's Buinaksk, will be transformed into a full-fledged division. She will also have new garrisons. In particular, it is planned to actively use the base in the village of Botlikh. There is a large, modern military town and a well-equipped training ground, where now the special forces are trained. An important element of the ongoing reorganization is the equipping of existing and newly created parts and units with the latest technology. So, motorized rifle divisions will receive the most powerful serial BMP-3, and tank ones will be equipped with the latest modification of the upgraded T-72B3. These cars differ from previous versions with reinforced armored protection and a more powerful engine - 1120 hp. The editor-in-chief of the magazine Arsenal of the Fatherland, Victor Murakhovsky, told Izvestia that the strengthening of the 58th Army is part of the measures to create a core of combined arms armies in the Southern and Western districts on the basis of divisional structures. According to him, it is necessary to form general-purpose forces, which will be guaranteed to contain the threat from NATO. - The experience of combat operations and exercises showed that the division is a more self-sufficient connection than a brigade. The latter usually requires reinforcement by means of combat and technical support and fire, "the expert said. - The division is more adapted to the physico-geographical features of the European part of Russia, where large spaces and a considerable length of lines of contact and fronts. 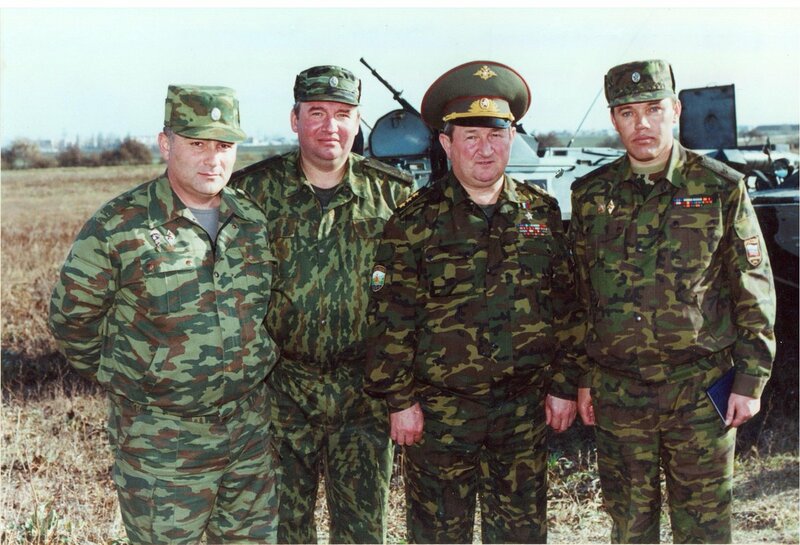 The 19th OMSB was established in 2009 as part of a military reform based on the 19th Motorized Rifle Division. This connection with a rich and glorious history. The division participated in many major operations of the Great Patriotic War. For the capture of the Bulgarian city of Shumlen, she received the corresponding name - Shumlenskaya. Later, the connection was awarded for crossing the Danube and participating in the liberation of Bratislava. The 136th OMSBR is a combat unit, which in the 1990s played a major role in protecting Dagestan from terrorists. During the fighting in 1999, her staff showed courage and courage. When performing combat missions, 36 servicemen were killed: 5 officers, 8 sergeants, 23 soldiers. Since 1999, more than 1,400 servicemen of the brigade were awarded orders and medals for participation in the counter-terrorist operation. Five officers were awarded the title of Hero of Russia. NOTE: think I will wait for the official MoD announcement. During the Syrian campaign, militants actively used grenade launchers of Western production - Carl Gustav and PanzerFaust. For their suppression of the range of shooting conventional RPG-7 was not enough. My understanding is that the RPO-M has a range of about 800m with a max range of about 1.7km and would therefore fill the role of unguided HE weapon to out shoot the Carl Gustav and Panzerfaust while being portable and relatively cheap. I rather suspect the rounds would be smaller and lighter and more portable than the SPG-9 rounds. SPG-9's original rounds had something like 300mm armor penetration. Newer with tandem warheads 400mm behind ERA so it can still take down anything but MBT. In era where any truck or MRAAP is armored it might be a good tool. My educated guess: smaller and lighter = less effect and shorter range. Perhaps also more expensive. Interesting photo-report from the festive event dedicated to the 100th anniversary of the creation of the Red Army, which took place on February 22, 2018 in Ivangorod (Leningrad region), near the border with Estonia (and near Narva), and included a very significant display of military equipment. It is worth noting the presence of the T-80BV tanks at the event. meh it wasn't Bardack Obama? MOSCOW, March 7 (Itar-Tass) - RIA Novosti. The level of equipping the Army with modern weapons has tripled since 2012, said Colonel-General Oleg Salyukov, Commander-in-Chief of the Land Forces of the Armed Forces of the Russian Federation. "Over the past five years, more than 10,000 units of modern weapons, military and special equipment have been delivered to the military in the framework of the current State Armament Program (GPV 2020), which has made it possible to increase the level of equipment with modern weapons three times, 45% (44.7% from 15%), "Salyukov said in an interview with the newspaper of the Russian Armed Forces Krasnaya Zvezda , published on the website of the newspaper on Wednesday. According to him, the task set by the President of the Russian Federation Vladimir Putin, to bring the share of modern weapons, is fulfilled (by the end of 2015 - at least 30%, by the end of 2020 - up to 70%). Salyukov stressed that at present the Army is fully equipped with all the necessary weapons and military equipment. "The systematically complete re-equipment of military vehicles with modern weapons models is being continued within the framework of the implementation of the GPU." According to the state defense order, modern samples are being purchased, as well as modernization of existing weapons, priority is given to the complete supply of weapons, reconnaissance, control, maintenance, maintenance, repair and training, as well as the necessary stock of missiles and ammunition, "the commander-in-chief said. "The experience of purchasing brigade complete sets of the main armament of the Iskander missile brigades, brigade and divisional sets of anti-aircraft defense systems - the S-300B4 anti-aircraft missile system, Buk-MZ and Tor-M2 air defense systems, and also the complete deliveries the battalion level of other weapons.This approach allows the full formation of units and units that are able in the shortest time to begin to perform tasks for the intended, "- explained Salyukov. He added that modern modernized self-propelled howitzers 2S19M2 Msta-SM, fully integrated into a single tactical control system, and modernized Tornado-G medium-range rocket launchers with the capability of automatic targeting of a combat vehicle on the target . "One artillery brigade, 14 battalions, four batteries of barreled and reactive artillery have already been re-equipped," the commander-in-chief explained. Russia’s Ministry of Defense has published a video showing brand new tank tactics filmed at the Pogonovo proving grounds. An all new tactic was rehearsed during military drills at Pogonovo proving grounds near the Russian city of Voronezh, in which battalion and division commanders of the Western Military district took part. "The special feature of this military exercise was a unique method of hitting targets at distances of up to 12 kilometers," said Timur Trubienko, army vice commander. The new tactics involve tanks posing as artillery and shooting from behind cover. Usually, tanks shoot only within their range of sight — but this time, they received intel from Orlan drones. Some figures from a Polish Military magazine on Russian Ground Forces equipment acquaintances from 2008-2017. Both new and modernized. Did someone see this aritcle in National Idiots... ur, Interest about the best armies in 2030?